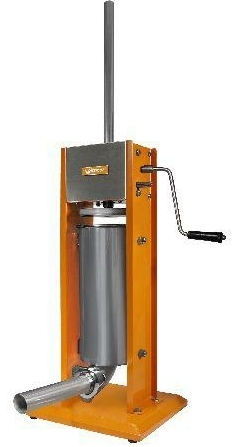 Quality stainless steel canister tilts out for quick loading. Heavy duty dual speed steel gears, pressure relief valve, steel housing with rubber feet for added stability. Unit disassembles for easy clean up. Includes 4 stuffing funnels: 13mm funnel for snack sticks and small diameter sausages, 20 mm funnel for smoked sausage, pepperoni, bratwurst and other similarly sized sausages, and a 30mm funnel for summer sausage, 40mm funnel bologna, salami, other large diameter sausages and can also be used for filling ground meat bags.